I have recently been trying out two beauty products all the way from Australia, from the team at Sugar Baby. They sent me a pack of their Hydrating Coconut Body Oil and some Coconut & Coffee Stimulating Body Scrub from their Vita+Skin range, which is available to buy at Superdrug. This summer I have been lucky to have a tan for most of the time as we went to Cala Bona at the end of May and then returned in August. I'm normally the pasty white one who won't wear normal summer clothes because I am so white, but this year it has been great having a bit of colour to my skin. Since Autumn is just around the corner, I have been trying extra hard to maintain the glow of my skin. These products couldn't have arrived at a better time and the fact that they have a coconut scent, means that I can carry that summer feeling into the coming season. 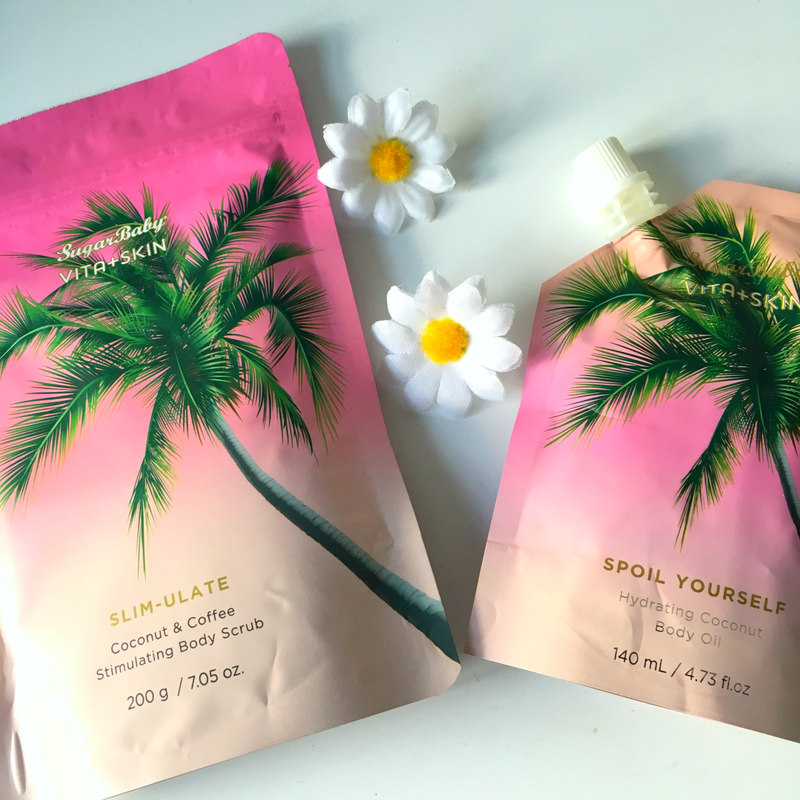 (Just look at those palm trees on the packaging) So, this is what I think about these products from Sugar Baby. The packaging of this product is squidgy with a screw top, perfect for being able to squeeze every last drop out at the end and you will probably want to do just this. When I took the lid off the powerful scent of coconut hit me straight away. The product is described as an oil, but it didn't run everywhere as you can see from the photo. It rubs in really well and you don't need a lot of it to gain good coverage on your skin. I liked how it made my skin shiny and I could still smell the sweet scent of coconut lingering on my skin. It reminded me of my holidays when you put suncream on. The oil doesn't soak right into your skin, but also didn't spoil my clothes either - there is no residue. What also impressed me about this product, was that it is organic and is suitable for use on your face and hair too. 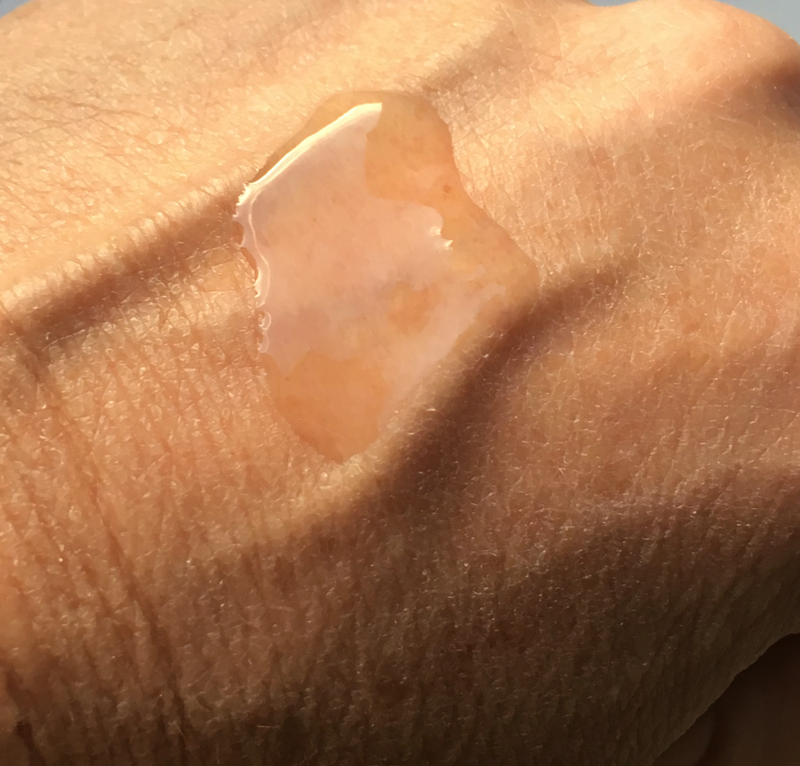 As you can see in the picture, it leaves a really healthy looking sheen on the skin. Who would have thought to put these two scents together, but it totally works. 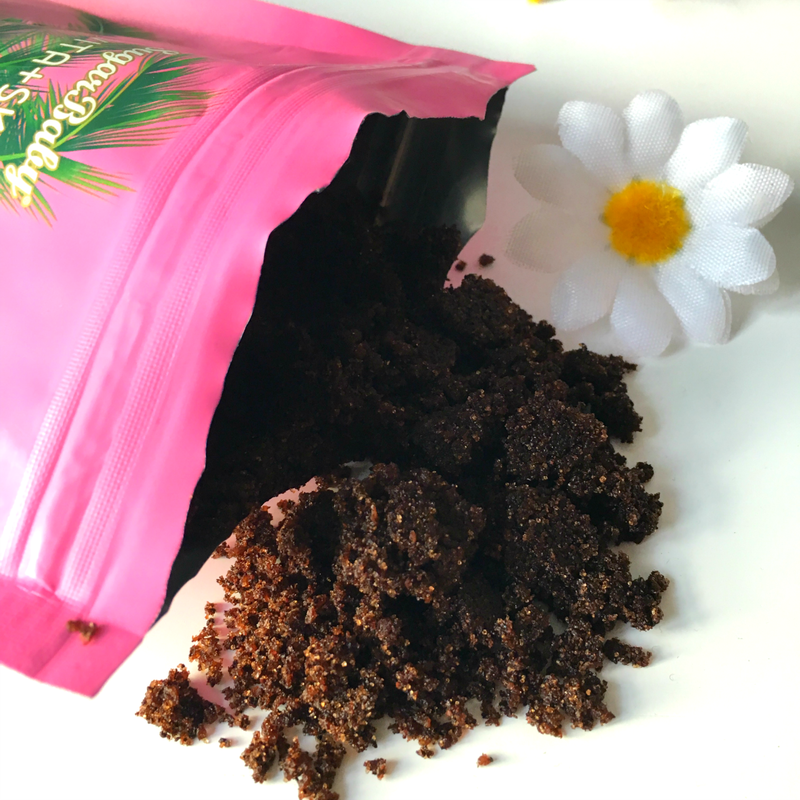 Yes when you first open the re-sealable packaging, you are met with a strong coffee granule scent, but it then softens and begins to smell like a really chocolatey cake. The granules are soft to the touch, not grainy at all which is brilliant if you are prone to broken veins. It is a natural exfoliator and it treated my skin with care. 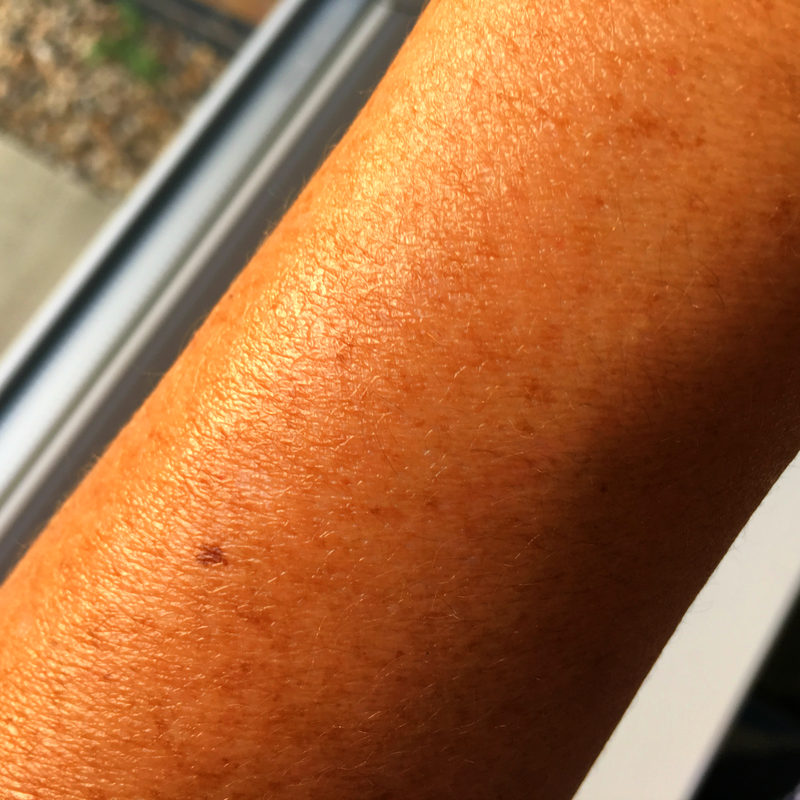 No scratchy exfoliation here, but it did a brilliant job of getting rid of dry, sun-tanned skin and I was left with a slight sheen, once again, due to the natural oils in the product. Sugar Baby have used coffee granules in this product, because of the caffeine in it. Caffeine is known to stimulate blood flow and circulation, when applied topically, and is thought to reduce the appearance of stretch marks and cellulite. I have really loved using this product. My products were genuinely sent over from Australia for me to try - direct from the Sugar Baby Headquarters, but if you would like to try this product you can buy it exclusively from Superdrug here. It is £10.00 for the scrub and £8.00 for the body oil. * I was sent both products in exchange for an honest review. All opinions are my own.